The closer you get to Quintessentials Bed and Breakfast and Spa, the more serene and inviting the scenery becomes. Past the scores of wineries and farm stands and nestled between the beaches of the Peconic Bay and the Long Island Sound, New York, you are transported to another place and time at our North Fork Long Island bed and breakfast. Every route that leads to East Marion is perfect preparation for the serenity that you will enjoy at this peaceful and romantic B&B Inn, located in Long IslandÃƒÂ¢Ã¯Â¿Â½Ã¯Â¿Â½s wine country on the North Fork, featuring five, comfortable, uniquely appointed rooms and suites with fireplaces, private decks, Jacuzzi tubs, and a European skin care spa which promotes wellness and healing. Located between the seaport villages of Greenport and Orient and a short ferry-ride via Shelter Island to the Hamptons, Quintessentials is just two hours from New York City, and within a 90-mile radius of Connecticut, New Jersey, Rhode Island and Massachusetts. Our North Fork Long Island bed and breakfast and spa is perfect for a romantic retreat, an intimate garden wedding, or a spa weekend. Quintessentials transports guests visiting this Plantation style sea captainÃƒÂ¢Ã¯Â¿Â½Ã¯Â¿Â½s home to a relaxing island escape like none other. Enjoy our acclaimed brunch breakfasts, afternoon refreshments, and nightly treats while basking in our warm hospitality. An acre of grounds showcases century-old trees, rare pink wisteria, rhododendrons, lilacs, hydrangeas, azaleas, heirloom flowers, herbs, ferns and climbing roses. Guests can choose to stroll in the meditation garden, sit by the fountain, drink afternoon tea in the Asian inspired Tea House, swing in the hammock built for two or just sit in the beautiful gazebo listening to birds sing and watching butterflies sip nectar as the quintessential anecdote to lifeÃƒÂ¢Ã¯Â¿Â½Ã¯Â¿Â½s stresses. As the North ForkÃƒÂ¢Ã¯Â¿Â½Ã¯Â¿Â½s first and only boutique B and B with a European Skincare Spa, Quintessentials introduced a new concept to the East EndÃƒÂ¢Ã¯Â¿Â½Ã¯Â¿Â½s Bed and Breakfast offerings. The lifestyle spa compliments the comfort and charm of our Inn for a completely rejuvenating experience for the body, mind and spirit. Choose from a menu of pampering services including herbal wraps, deliciously scented scrubs, massages, facials, cosmetic application, reflexology, Reiki, and image coaching consulting. 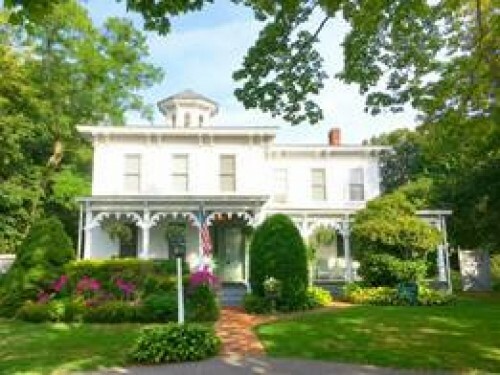 Come to Quintessentials B&B for an authentic, local experience and enjoy genuine care, comfort, and relaxation. YouÃƒÂ¢Ã¯Â¿Â½Ã¯Â¿Â½ll balance and rejuvenate your body, mind and spirit, and we guarantee youÃƒÂ¢Ã¯Â¿Â½Ã¯Â¿Â½ll take home wonderful memories leaving you wanting to return. Take a moment to visit our rooms, review our spa menu, check the availability and then call us to arrange your activities and book a stay at Quintessentials. Check our Blog at the bottom of the page for the latest area news, events, media and trade awards, and Quintessentials specials. Quintessentials Bed & Breakfast & Spa is a small property where every guest reservation made is both important and special to us. A deposit of 50% of stay is required to hold your room at our North Fork Long Island accommodations. For one night, the full amount is required. We process the deposit upon making your reservation. Full amount/balance is required 21 days prior to your arrival date. If your travel plans change and you must cancel your reservation, please call us at least 21 (twenty-one) days prior to your arrival date for a cheerful refund of your deposit less a $65 processing fee. For weddings and groups of 3 rooms or more, cancellations prior to 30 days will receive a cheerful refund of deposit, minus a $75 cancellation fee per room. We suggest that you take out travel insurance, in case you have to cancel. In the unlikely event that you must cancel with less than twenty-one (21) daysÃ¢ï¿½ï¿½ notice, shorten your stay or check out early, (less than 30 days, weddings and other groups) please understand that we must ask you to take responsibility for your entire reservation. If we can re-book your room(s), a refund will be made, less one (1) nightÃ¢ï¿½ï¿½s rate, per room. No refund for a 1-night booking. For weddings and other groups of 3 rooms or more, cancellations prior to 30 days will receive a full refund of deposit, less one (1) nightÃ¢ï¿½ï¿½s rate, per room. We suggest that you take out travel insurance, in case you have to cancel. For weddings and other groups of 3 rooms or more, cancellations prior to 30 days will receive a full refund of deposit, less one (1) nightÃ¢ï¿½ï¿½s rate, per room. We suggest that you take out travel insurance, in case you have to cancel. All rates at our North Fork Long Island accommodations are for single or double occupancy and include a full brunch-breakfast, afternoon refreshments, and snack basket in your room. By popular request and for our guests relaxation and enjoyment, breakfast is served each day at 9:45am. Coffee and Tea are served beginning at 8:15am. New York Sales & Hotel Taxes are additional. Deposits and/or payments by check must be guaranteed with a valid credit card. Check-in is at 3:00PM. If you arrive between 1:30pm and 3pm, we cannot guarantee your room will be ready, but we will be happy to check your bags and send you off to lunch or sightseeing. We cannot attend to guests checking-in before 1:30PM, as we are taking care of the registered guests. If you will be arriving after 3PM check-in, please let us know in advance, so that we can cover your welcome to Quintessentials. Please let us know if you will be checking in after 6:00 p.m. Rooms will be held until 6:00 PM, unless prior alternative arrangements are made. GuestÃ¢ï¿½ï¿½s failure to check in by 6:00 p.m. on the day scheduled will be treated as a cancellation of reservation within 14 days, in which case there is no refund. No-shows, late check-ins and early checkouts are responsible for payment of the entire reservation and all spa services booked. Guest agrees that proper notice for cancellation will be given by acknowledged e-mail, telephone or text message. For clarity sake: if room is reserved for 3:00 p.m. 6/29, 21 days before arrival is 3pm 6/08. Full refund is allowed if notice of cancellation is given before 3:00 p.m. 6/08, less a $65 per room cancellation fee. Spa Services booked must be cancelled 7 days in advance to avoid a 50% cancellation fee. There is no refund for spa services cancelled within 48 hours. Technical -computer/internet glitches do occur, even though rarely. We are sorry in advance for any inconvenience, but we have no control over when the glitch occurs. We will do our best to help sort it out. Gift Certificates are not redeemable for cash. They are redeemable for lodging or Quintessentials spa products or services. Please check expiration date on Gift Certificate. A 20% service charge is applied to all group bookings (three people and more) for spa services. A 5% service and gratuity charge is applied to group bookings for lodging. The staff appreciates your gratuities. There is no smoking permitted inside the house or rooms; however you may smoke in the Garden or on your deck with the doors closed. Guest smoking in the rooms credit card will be charged an extra nightÃ¢ï¿½ï¿½s fee while we return the room to a non-smoking status. The Fire House nearby sounds a 7- second alarm on the North Fork and the Hamptons every day at 6PM. Sometimes, it goes off if there is an emergency. We are sorry in advance for any inconvenience, but we have no control over when emergencies will occur. Supervised children, 12 years or older, are welcome mid-week and some weekends. Since some weekends are not suitable for children, the supervising adult must call first. Regretfully, we cannot accommodate any pets. We will gladly set up boarding nearby. Rate quoted is for 2 people to a room. 2-night minimum stay from May to November. Friday, Saturday, or Sunday night only reservations (if available) is subject to a surcharge. Please inquire first. 3-Night minimum stay required on holidays, including Memorial, Independence, Labor, Columbus, and Thanksgiving Days, Christmas, and New YearÃ¢ï¿½ï¿½s and ValentineÃ¢ï¿½ï¿½s weekend. New YearÃ¢ï¿½ï¿½s Eve holiday Ã¢ï¿½ï¿½rates and minimum stays vary. Please inquire, when you book. 631-477-9400. Mention specials to get value. Some Specials, Promotions, Coupons and Gift Cards are not valid for Holidays, Holiday Periods/Holiday Weekends. When making reservations, please announce at the beginning, if redeeming Gift Certificates to pay for spa or lodgings. Quintessentials accepts Bed and Breakfast.com Gift Certificates, November through April, except holidays, towards payment for lodging for the cost of 1 nightÃ¢ï¿½ï¿½s stay at regular season price, less taxes, at Quintessentials B&B. Guess must book a minimum of 2 nights and mention when making reservation that they are using a Gift Card to pay part of their lodging costs. Guests are responsible for paying all necessary taxes. Cannot be used with any other promotions, specials, or Gift Certificates. Guests can use up to 3 Bed and Breakfast.com Gift Cards towards payment of their last nightÃ¢ï¿½ï¿½s stay. Suggest guests read Bed and Breakfast.com Gift Card policies on their website. Third Party Site Bookings rates and conditions are as agreed on Third Party sites. Throughout the year, full rates are in effect on Holidays, Holiday Periods, and some Special Events. Certain Specials and Promotional Prices in 3rd Party advertisements are as stated in those agreements. **Rooms & Rates Shown: November to April-Off-Season Rates. May to October Ã¢ï¿½ï¿½ High-Season Rates. ***Policy and Prices can be changed at any time without notice. Ask about Quintessentials Specials & Packages: Spa, Elopement Wedding, Honeymoon, Anniversary, Birthday, Mid-Week, Golf, Fishing, Group and Business packages. Gift Certificatesand Gift Baskets are available for all occasions at the B&B and the Spa. (Overnight delivery available).